Apollo, the sun god, son of Leto and Zeus–god of light and the sun, truth and prophecy, healing, plague, music, and poetry; leader of the muses. In my cosmology, all hell and heaven are within me, while I am alive in this body in this time and place on earth. In the Greek cosmology, all the prototypes are externalized and personified. “Looking at love is like looking at the sun.” – Walter Traggert. 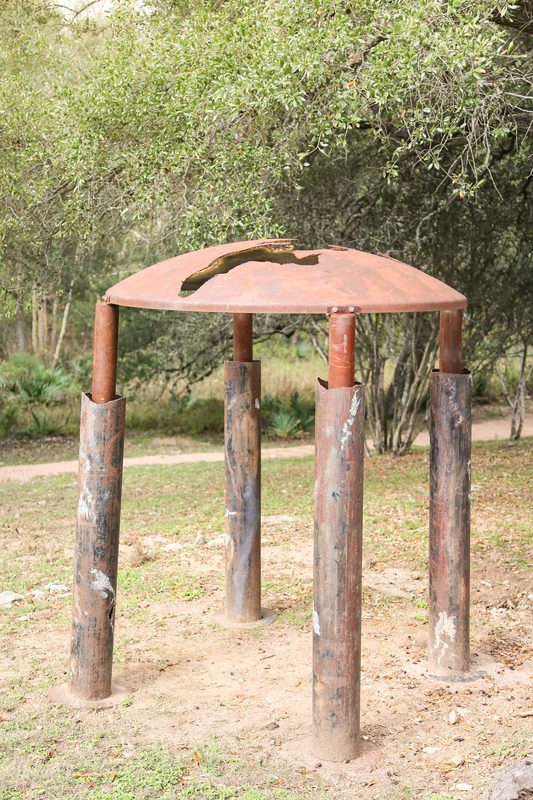 This piece began with a 72″ diameter 1/4″ thick steel dish, as the dome to a personal sacred space, a mini temple of adoration and concentration. Creating the cutout shape was a process of making many quick ink drawings composed within a circle and choosing the one with the most dynamic round composition to be seen from any angle. The shape was projected onto the dome and cut out using a plasma cutter. The 4 sleeves that cover the posts are also hand drawn with a plasma cutter, ink and patina on steel.